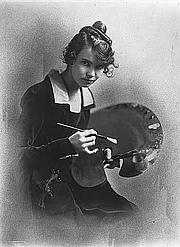 Wanda Gag holding artist's palette, 1916-1917. Wanda Gág was a daughter of Anton Gág, a Minnesota photographer and painter, and the much older sister of Flavia Gág. As well as being the translator and illustrator of several editions of Grimm’s fairy tales, Wanda Gág was the author- illustrator of several popular children’s books of her own such as Millions of Cats (1928), which won the Newbery Award and was translated into many languages. She also published an autobiography, Growing Pains: Diaries and Drawings for the Years 1908-1917 (1940). Wanda Gág is currently considered a "single author." If one or more works are by a distinct, homonymous authors, go ahead and split the author. Wanda Gág is composed of 15 names. You can examine and separate out names.